My uncle would always say, “having the right tool for the job, makes all the difference in the world”. That is so true! As an avid traveler, this is a list of some of the best travel gear that are my favorite go-to items I always keep in my carry-on. Traveling is thirsty work. Regardless if you are exploring the streets, hiking trails, or sitting on a plane it is easy to get dehydrated. The Greengo Smart Solutions collapsible water bottle is a great way to help combat dehydration. Made from food-grade silicone this collapsible water bottle can be used with hot or cold liquids, rolls up to take minimal space, and comes with a cleaning sponge brush. I always travel with a scarf. I like scarves with a bit of a pattern that will hide any mishaps and that I can dress up or down depending on the day and location. I am particularly infatuated with this infinity scarf because it has a hidden zippered pocket that is handy to access. I remember the days of undergarment hidden belts that were awkward to access and became bulky if there was anything more than a passport. Not so anymore with this machine washable infinity scarf made from renewable bamboo and polyester. Electronic gadgets have become so integrated they are a vital part of our lives. Whether it is a phone, a laptop, or a camera – most people travel with something that needs to be powered up. Next to my solar charger (which is listed below), my Compass Rose Travel adapter is always a must regardless of where I am travelling. I love the velvety feel of the housing and the bright red color that makes it easy to find in the bottom of my computer bag. I also love that it has a prong plug and USB ports so I can charge 3 devices at the same time. In addition to international plugs for over 150 countries, it also has a plug for US outlets so I can use it for domestic travel as well. This is an excellent travel accessory to have a permanent home in your carry-on. Ladies, it is so important to protect and nourish your skin. We put our skin through a lot when we travel, and let’s face it (sorry, pun intended), sometimes when we get to our location the last thing we are thinking about is cleaning our faces. We jump time zones, expose our skin to different humidity and air toxicity levels, not to mention the variety of food and drinks that we do not normally consume. I started traveling with facial cleansing cloths a while ago when TSA started cracking down on liquids. The first cloths I used were really nothing more than regular wipes that were heavy on the alcohol and light on nourishing ingredients for my face. Until I discovered Younique Royalty Shine Cleansing Cloths. The cloths are soft, disposable, nourishing for your skin. They are infused with olive and sunflower oils, vitamin E, jojoba, and rosemary. I now keep a pack both in my carry-on and in my bathroom at home. Does this sound familiar? You pack for a trip and lift your suitcase and try to judge how heavy it is. You set it on a bathroom scale, but you can’t see the weight because the suitcase covers the numbers. So you hold it while you are trying to guess your own weight, then subtract the amount displayed on the scale hoping that you’re guessing correctly. When you get to the airport you discover that you are three pounds over the weight limit. Now, you are repacking your luggage, on the floor, in the middle of the airport. Since I have picked up one of these handy Travelon luggage scales, that is one travel concern that I no longer have to worry about. This little gadget has a permanent home in my carry-on. I love it because it folds up compactly, does not require batteries, inexpensive, and accurate. I always check the weight of my luggage before I leave for the airport and am never surprised. I love pockets. They are so handy for keeping all your travel essentials close. My favorite travel clothes will always have at least one hidden pocket with a zipper. They are fabulous for keeping your passport, credit cards, and larger paper bills close at hand without being easy targets for pickpockets. Clever Travel Companion has come out with cozy v-neck knit shirts for both men and women that have two (a little bit of heaven for me) hidden zippered pockets located on the side seams. Available in a variety of colors and made of breathable cotton and spandex, these shirts are great to wear on their own or layered with a sports coat for a casual chic look (or a GQ look for guys). If you are like me, you might have a tendency to over shop when you travel. You are having such a great time that you sort of forget that you have a limited space to work with. That is when I pull out my travel compression bags which I always toss in my carry-on for just-in-case moments. If you have never used them before, pick up a set and try them on your next adventure. One of the best travel gear gadgets I have in my bag is my solar power bank. First, it recharges with either solar or by mini-USB. Secondly, I have had three phones plugged into it at one time charging. I have also recharged my phone three full times when my phone was at less than 5% without having to recharge the power bank. I never travel without it. When I tell people the one article of clothing that always travels with me is a heated vest, they usually look at me wondering if they heard me correctly. The Ororo vest is amazing! It comes with a rechargeable battery that will charge a single device such as a phone while it is keeping your core temperature up. It has four settings – low, medium, high, and off. An added bonus, when you are not using the vest it rolls nicely into a pillow. 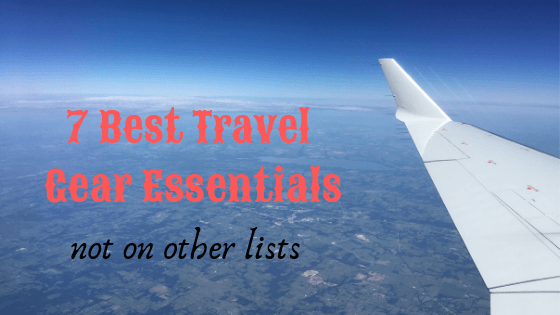 From one traveler to another, I hope this list is helpful for you to find the right tools to make your travels smoother and your adventures more enjoyable. What are your must-haves when you travel? What do you think I need to add to my list? Thank you for reading this travel nugget of knowledge about travel essentials to pack. This article may contain an affiliate link or two, which does not affect you in any way, but will allow Empty Nestopia to continue to bring you travel tidbits.